Today was the type of run that every runner should have for a first race, no matter the distance. The weather was perfect, I enjoyed every step, I met my goal yet took time to celebrate with spectators, take selfies with family and friends and ran with some amazing women who helped me enjoy the race. I’ve run longer races and short races but today was the perfect race. As of right now, this is my favorite race that I’ve done. So on race day you should do nothing different from what you’ve done in training runs. Today I did three new things. I ran with flatties. 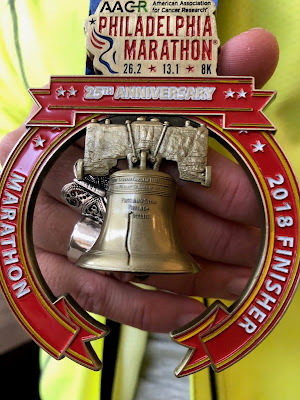 (Pictures of running friends from around the country). I ran with shoes that only have 3 miles on them. I hear the collective gasp now. Seriously, they are Vibrams and I they don’t really need to be broken in. *I was up at 5 am for a 7:30 start time. That was a perfect time for me to drink an oatmeal smoothie, a cup of tea and get Mr. Basbe and Tink up. 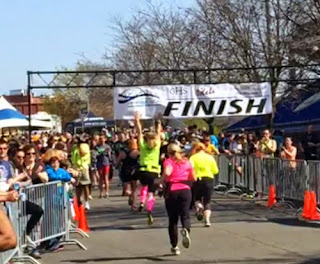 *We got near NYSEG Stadium a little before 7am and had about a block walk to the start area. *The bathroom line was crazy long but it moved really fast. I’ve never seen a women’s room line move so fast. Mile 1 - Bridge #1 - part way into it, I noticed two girls behind me chatting. I knew I wanted to stay near them because if they were talking, it would help keep a more even pace. I interjected into their conversation a few times. I love runners because they don’t get as bitchy about you butting your nose into conversations. We all love to talk running. Mile 2 - Was pretty uneventful. I was feeling great. Running right on pace. Still running with the other two girls and we’re all chatting away. Mile 3 - A slight up hill and then downhill till mile 4. Loving the energy of the spectators and the volunteers. Mile 4 - Bridge #2 - Ran into Mr. Basbe and Tink. Stopped for a quick selfie. Picked up another woman to join our group. The 4 of us ran the rest of the race together. Did the “Roger Airplane” (another thing from our running group) for the camera man. Mile 5 - Saw my 2nd favorite sign “Run like it’s the beginning of the Hunger Games” The slight hill by the old Crowley building was a bit painful. My right arch started acting up and I couldn’t stop focusing on it. By the end of mile 5 I decided to just ignore it and it went away. Mile 6 - Bridge #3 & 4 - This mile goes across a bridge and to a River Trail. The shade was nice. It was exciting to hit the half way mark and realize that if I kept at this pace, I’d hit my goal of sub 2:30. Saw my honey and Tink again! Mile 7 - Goes down a long road that is rolling hills. I saw another friend there and my favorite sign….had my name on it :) Stopped for another selfie with her. Mile 8 - Starting to feel some pain. My pace has slowed a bit and one of the girls was starting to struggle. I saw my mom during this mile which was really rejuvenating for me. Stopped for a selfie with her. Mile 9 - More of the same. Still loving it and feel ok but struggling a little. So very grateful for the girls I’d met and were running with. They’ve helped me not to run too fast and to keep a good pace. Mile 10 - Another Subber found me. Took another selfie. She was doing great! Hope to see here again at other races. Mile 11 - Bridge #5 - To me this is the home stretch. This road goes right down to mile 13. It’s slightly uphill but then mostly a nice gentle downhill. I’m getting really tired here. I’ve only done 12 miles in training runs. The other girl who was struggling is slowing down a bit too. To me this is what running is about, competing against ourselves but there to support those around me. I decided that since this was my 1st half, no matter what time I finished, it would be an instant PR and I thew my expectations out the window. I just wanted to give back and be there to encourage another runner. Mile 12 - Nothing exciting happening this mile. Just wanting to get to the finish line. I mentally felt great but my legs and feet were really tired. I was glad I was running with someone else because a few times I wanted to walk. Me not walking, kept her from walking too. It was nice to support each other. The other two girls were slightly ahead of us. Mile 13 - We both picked up our pace with the joy that the race was almost over. It was beautiful where they had the finish line because it was all downhill to it. Mile 13.1 - I jumped and touched the finish line as we crossed it! Finished with a Net Time of 2:24:33!! You're my running hero! I'm so proud of all your accomplishments! I love you! Aw, Thank you! I think of you and wish you could be with me. I hope the day will come!! I love you too my dear friend.